Days after GladeValley.net listed developments under review by the Walkersville Planning Commission, Verdant Development Group asked for a preliminary discussion and comments on a proposed development, Parkside, on Biggs Ford Road. Proposed developments along Biggs Ford Road / Pennsylvania Avenue (click for larger image). The property lies south of Biggs Ford Road just before Kenneth Drive, and had been listed for sale a few months ago, and had been a working farm. The developer proposes twenty-six lots of “upscale, large” properties. The property is very close to another development in the works, Mill Run, which proposes twenty-two lots. Verdant Development Group plans to build a walking path from Biggs Ford Road to Walkersville Community Park along the property’s south-east boundary. They will also build a walking path from the development to the park. 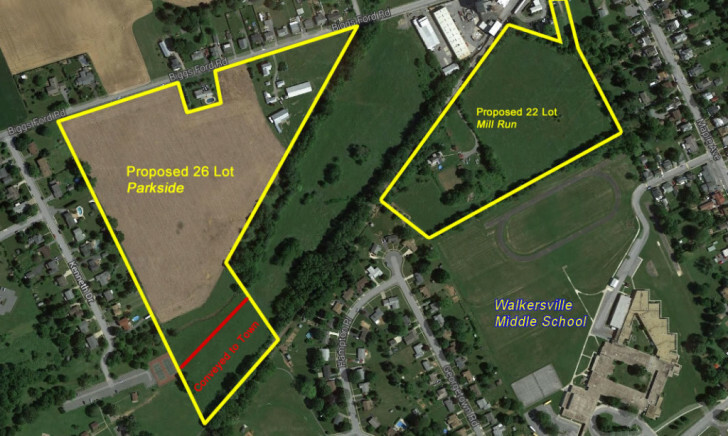 As part of the town’s open space requirement, the developer will convey 2.3 acres to the Town of Walkersville which will be part of Walkersville Community Park. That land lies adjacent to a 1.86 acre forest resource area through which Glade Creek flows. The Walkersville Planning Commission will discuss Verdant Development Group’s proposal to build a road that is twenty-three feet wide. According to the Town of Walkersville’s Design Manual and Town Code, a thirty-two foot wide road would be required. According to the Town of Walkersville’s Comprehensive Plan Map, this property is zoned for Low Density Residential. The Comprehensive Plan was adopted in 2011. The Walkersville Planning Commission will meet Tuesday, May 27, 2014 in Town Hall at 7:30 p.m.